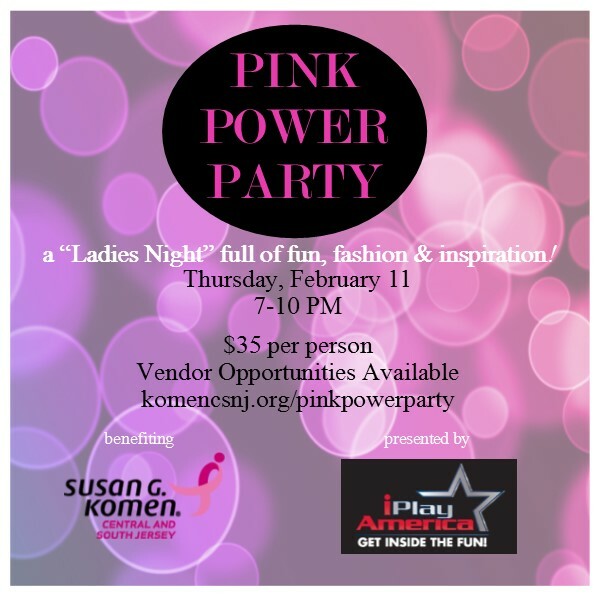 Freehold, NJ — iPlay America will host a fantastic evening of fun, fashion, and fabulous foodstuffs to benefit the Susan G. Komen Central and South New Jersey Affiliate on Thursday, February 11, 2016 at 7 pm. It’s called the Pink Power Party, this event is a “ladies night out” featuring a roaming fashion show, local vendors, delicious fare and delightful cocktails! There will be a raffle held during the event for prizes including $500 Gift Card to Gold n’ Time Jewelers, Social Membership for Bella Vista Country Club, plus baskets of jewelry, gift cards and makeup. Proceeds from the evening’s festivities will support the Susan G. Komen Central and South New Jersey Affiliate’s vision of a world without breast cancer. Tickets are $35 per person and include 2 raffle prize tickets. The Susan G. Komen Central and South New Jersey Affiliate provides local programs to help underserved women access free education and mammograms, supports national research programs, and every four years conducts a needs assessment within the 13 counties served that outlines breast health and breast cancer needs and the resources that exist to meet those needs. Held at iPlay America this year’s event is sponsored by: Rebecca Proske-Charles Schwab, Monmouth County Ask the Doctor, and will be supported by these Freehold featured vendors: Jewelry Design Gallery, Lolas NJ, & DB Jewelry Design Inc.
“The Pink Power Party promises to be an excellent opportunity for concerned and dedicated supporters of the Susan G. Komen Central and South New Jersey Affiliate to come out and have a truly fabulous evening out at iPlay America, while carrying on the vital and important work the group does for New Jersey,” said Jessica Schwartz, vice president of sales and marketing. For tickets go to iPlayAmerica.com/special-event/pink-power-party. From the moment guests step inside iPlay America, they enter a world of fun like no other. iPlay America, the indoor city, recreates the Jersey Shore from more than 30,000-feet of Boardwalk space and mid-way style games people loved as kids, to the asphalt city streets complete with two-story buildings, mailboxes, fire hydrants, benches and more to create the feel of downtown. ALWAYS free to enter, guests can access affordable play packages for all of the rides and attractions iPlay America has to offer in their 115,000 square feet of space! Visitors can race on the iPA Speedway go karts, challenge their friends to an epic battle of laser tag in the two-level Cosmic Battle Laser Tag Experience (largest in Central New Jersey! ), spin around in the bumper cars and take flight on Kite Flyer, as well as other favorite rides! The 4-D Theatre is a multi-sensory movie experience not to be missed and the HUGE Arcade has something for everyone with over 200 of the newest and hottest games including classics like skee-ball and air hockey! To satisfy everyone’s appetite, iPlay America offers Boardwalk style fare from hot dogs and pizza, to cotton candy and funnel cakes as well as Broadway Sweets, the BEST candy store in Central New Jersey! Sit and relax on the Game Time Bar & Grill porch that overlooks city square. Enjoy delicious favorites on its American menu, specialty cocktails, and signature creations by Executive Chef Joe Raiola, a season five “Chopped” champion. Guests can watch their favorite team play on over 20 different flat screen TV’s and 3 large screen projectors! iPlay America also offers a special discount to veterans and active military personnel. No matter who wants to have fun — or how they want to play — iPlay America is the place to Get Inside the Fun!